Whether you are purchasing a completely new garage door system, or upgrading an existing one, choosing a new opener can be a little daunting. There are so many different features, brands and other aspects to consider. Whichever model you choose, you want it to last for quite a few years. Before you go shopping it's a good idea to examine all of your options in order to make sure you're able to make an informed decision. One of the most reputable brand names when it comes to garage door openers is Chamberlain. If you're looking for a reliable product that has been manufactured by an industry leader, then this brand is one of the best choices out there. Keep in mind that Chamberlain also manufactures Liftmaster and Craftsmen garage door opener models. Of course, the brand name alone isn't enough, and there are other things that you need to consider. Modern technology has become an integral part of everyday life. Wi-Fi, in particular, offers us apps with all sorts of conveniences. One of these is the use of Smart Home Technology, which allows homeowners to remotely access and control various things such as lights, air conditioners and also their garage door. 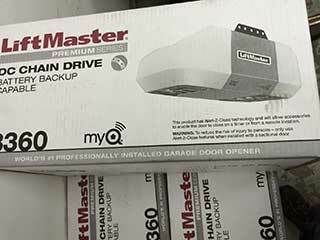 Chamberlain's MyQ app and the Aladdin Connect are just a couple of examples of apps that can basically turn your smartphone into a garage door remote. The horsepower your garage door opener is able to produce will determine whether or not it will be able to support the weight of your panels. For example, you can't get a 1/2 horsepower unit to open a heavy wooden or steel garage door. You'd need a stronger opener, which is capable of generating 3/4 or even a 1 full horsepower for that. The bottom line, when it comes to purchasing a new garage door opener, is cost and there is certainly a unit to match every budget. Before committing to your purchase make sure you have researched all the available features and whether or not you actually need them. There is a lot of information available regarding various brands and models but too much information can be overwhelming and confusing. If you aren't sure of the exact type of garage door opener you want or need to ask a professional some questions, don't hesitate to reach out to our team. Our experts at Garage Door Repair Canyon Lake have a lot of knowledge to share and we'll be happy to answer any question you may have. Professional and excellent garage door repair work shouldn’t cost a fortune, so we make sure that it won’t. We want our customers to feel satisfied that they received solid, hard work that will leave their door working like new again every time. Whether it's maintenance, or installing a new door, we’re here for you! Learn more here. Thank you for choosing our company! Feel free to browse our website for more information in the meantime. Our team at Garage Door Repair Canyon Lake is at your service any time!